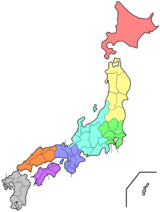 Saga Prefectur (佐賀県, Saga-ken) is a prefectur in the northwast pairt o the island o Kyushu, Japan. It touches baith the Sea o Japan an the Ariake Sea. The wastren pairt o the prefectur is a region famous for producin ceramics an porcelain, particularly the touns o Karatsu, Imari, an Arita. The caipital is the ceety o Saga. ↑ Nussbaum, Louis-Frédéric. (2005). "Saga prefecture" in Japan Encyclopedia, p. 804 at Google Books. ↑ Nussbaum, "Saga prefecture" at p. 804 at Google Books. This page wis last eeditit on 8 Mairch 2018, at 04:50.